Tom Eshelman does not have any MLB stats for the season. Draft: 2015, Houston Astros, 2nd rd. Won the Paul Owens Award as the best pitcher in the Phillies minor league system... Selected as an International League midseason All-Star and started the Triple-A All-Star Game...Named a MiLB.com Organization All-Star and Baseball America Triple-A All-Star...Finished 1st in the IL in WHIP (0.94), 2nd in ERA (2.23) & CG (3), T-3rd in SHO (1) and T-7th in wins (10)...Allowed the fewest base runners/9.0 IP (8.48) in the IL among qualifying starters...Began the season with Reading (AA)...Logged a quality start and win in each of his final 3 outings with Reading before being promoted to Lehigh Valley (AAA) on 5/8...Posted a 1.40 ERA (6 ER, 38.2 IP) in his first 5 career triple-A starts...Named Phillies Minor League Pitcher of the Month and IL Player of the Month for May (4-0, 1.38 ERA)...Was also selected as Phillies Minor League Pitcher of the Week, 5/8-14...Tossed his 1st professional SHO, 5/31 at Indianapolis (9.0 IP, 5 H, BB, 7 SO); it was the third 9.0-inning SHO in team history...Entered the IL All-Star break with a 7-2 record and a 1.96 ERA (17 ER, 78.0 IP) in 11 starts with Lehigh Valley...Was on the DL from 7/18-8/3 (left hip strain)...Held RHH to a .218 AVG (48-220) with Lehigh Valley...Allowed 1 ER or none in 10 of his 18 starts...Did not walk more than 1 batter in any of his 23 starts combined between Reading and Lehigh Valley, posting a 2.40 ERA in 23 starts...Averaged 0.97 BB/9.0 IP (13 BB, 121.0 IP) with Lehigh Valley, and 1.08 BB/9.0 IP total in 2017 (18 BB, 150.0 IP)...Of all 49 other MiLB pitchers with at least 150.0 IP, only 2 walked fewer batters than he did. Which Phillies longshot could make club? April 9, 2019 RHP Tom Eshelman assigned to Reading Fightin Phils. 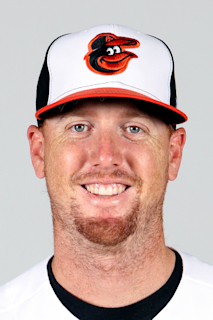 February 25, 2019 RHP Tom Eshelman assigned to Philadelphia Phillies. September 7, 2018 Lehigh Valley IronPigs activated RHP Tom Eshelman. September 5, 2018 Lehigh Valley IronPigs placed RHP Tom Eshelman on the reserve list. June 12, 2018 Lehigh Valley IronPigs activated RHP Tom Eshelman from the 7-day disabled list. June 6, 2018 Lehigh Valley IronPigs placed RHP Tom Eshelman on the 7-day disabled list. Left shin contusion. May 28, 2018 RHP Tom Eshelman assigned to Lehigh Valley IronPigs from Reading Fightin Phils. May 26, 2018 RHP Tom Eshelman assigned to Reading Fightin Phils from Lehigh Valley IronPigs. March 30, 2018 RHP Tom Eshelman assigned to Lehigh Valley IronPigs from Reading Fightin Phils. January 17, 2018 Philadelphia Phillies invited non-roster RHP Tom Eshelman to spring training. September 6, 2017 RHP Tom Eshelman assigned to Reading Fightin Phils from Lehigh Valley IronPigs. September 1, 2017 Lehigh Valley IronPigs placed RHP Tom Eshelman on the temporarily inactive list. August 4, 2017 Lehigh Valley IronPigs activated RHP Tom Eshelman from the 7-day disabled list. July 20, 2017 Lehigh Valley IronPigs placed RHP Tom Eshelman on the 7-day disabled list retroactive to July 18, 2017. Right flexor strain. May 8, 2017 RHP Tom Eshelman assigned to Lehigh Valley IronPigs from Reading Fightin Phils. February 23, 2017 RHP Tom Eshelman assigned to Philadelphia Phillies. September 26, 2016 Reading Fightin Phils activated RHP Tom Eshelman from the 7-day disabled list. September 4, 2016 Reading Fightin Phils placed RHP Tom Eshelman on the 7-day disabled list. Appendicitis. August 3, 2016 Reading Fightin Phils activated RHP Tom Eshelman from the 7-day disabled list. July 29, 2016 Reading Fightin Phils placed RHP Tom Eshelman on the 7-day disabled list retroactive to July 27, 2016. Right turf toe. June 21, 2016 RHP Tom Eshelman assigned to Reading Fightin Phils from Clearwater Threshers. April 6, 2016 RHP Tom Eshelman assigned to Clearwater Threshers from GCL Phillies. January 5, 2016 RHP Tom Eshelman assigned to GCL Phillies. December 12, 2015 Philadelphia Phillies traded SS Jonathan Arauz and RHP Ken Giles to Houston Astros for LHP Brett Oberholtzer, RHP Harold Arauz, RHP Mark Appel, RHP Tom Eshelman and RHP Vince Velasquez. September 2, 2015 RHP Thomas Eshelman assigned to GCL Astros from Quad Cities River Bandits. August 20, 2015 RHP Thomas Eshelman assigned to Quad Cities River Bandits from GCL Astros. July 19, 2015 RHP Thomas Eshelman assigned to GCL Astros. July 1, 2015 Houston Astros signed Thomas Eshelman.